Bra Fitting - What’s the number one secret for looking fantastic and making your clothes look tailor made for your shape? It all starts with a proper fitting bra. When you nail your foundation with the right intimate apparel, looking fabulous from head to toe is a cinch. From popular brands to bra fit tips, bra size essentials to how to fit a bra, we take a closer look at the basics - and show you the inside skinny on for your best look ever. Finding The Right Bra Size – It's easier than you imagines to avoid these common pitfalls and set yourself up for success. What To Sidestep. Bra Measurements – Taking your measurements is only the start of finding the right bra. It’s how you interpret those measurements that gets you the best fit. How To Decipher The Numbers. Bra Size Converter – Never wear the wrong bra size again!Our tell-all guide shows you just how easy it is to find the bra of your dreams. Get Your Size. How To Fit A Bra – Spare yourself from measuring tape only to end up with the wrong size for your shape. Throw Away The Measure For Good. Take Off Bra – In the blink of an eye, there's more than one easy and quick way to slip out of your bra and keep it looking pristine. Quick And Easy Tips. Q. How often should I replace my bras? A. It depends on how often you wear them. If they're favorites that you wear regularly, the general rule of thumb is approximately 6 months to a year. Size matters, but so does style, cut, and even attitude. Slip into a bra that gives you curves that you never thought possible with these tips for showing off your shape in the perfect bra for you. Bra Fit – Cut through the confusion with these easy tricks and tricks to navigate the right fit and create the feminine shape you’ve always wanted. Best Practices Guide. ﻿Bra Size Calculator – We show how easy it is to calculate your bra size, get a great fit, and join the ranks of the world’s most gorgeous supermodels. Insider Tips. Correct Bra Size – Nail your bra size for comfort, coverage, and a beautiful look that will have everyone wondering what your secret is. Discover The Essentials. Bra Sizes – All bras are not created equal, and we’ve taken all of the guesswork out of how to fit the bra brands that women love. Read Our Reviews. 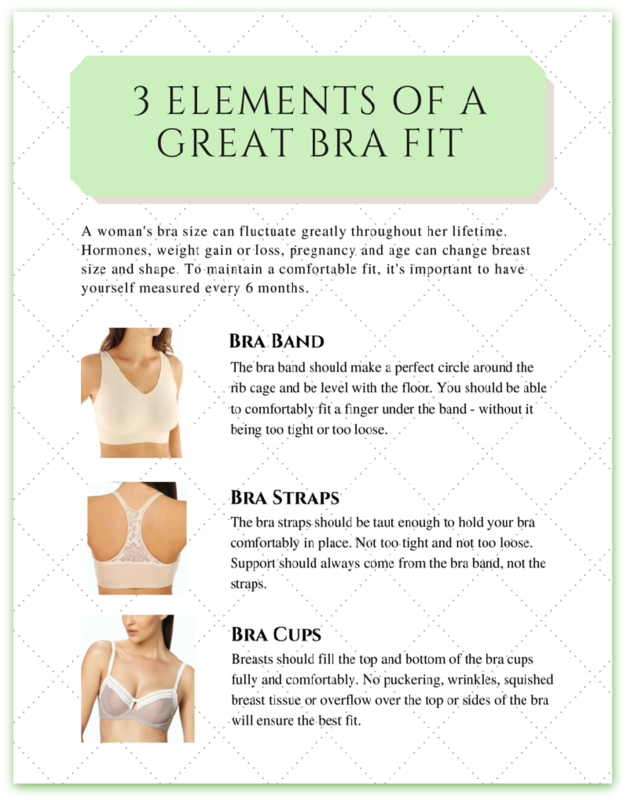 Determine Bra Size - Besides being fitted by a lingerie specialist at a department or specialty store, there are quick and easy ways to determine bra size. Try These Clever Tips.